While foreclosure activity is dropping in most major cities, there are some metropolises where foreclosed properties still account for too large of a percentage of homes on the market. Here’s the question for home buyers: Do high-foreclosure markets actually represent an opportunity? Do these cities give buyers a chance to get into city neighborhoods that they otherwise might not be able to afford? Yes, they do. But buyers have to be careful: Purchasing a home that is in foreclosure can lead to big problems. Home buyers who want a good deal in real estate invariably think first about buying a foreclosure. They think, sure, I’ll do a little work to get a cheap price. They believe banks are desperate to dump these awful homes, and that’s not true, either. Some well-meaning buyers have this picture in their mind of a cute little house, surrounded by a white picket fence that is owned by a widowed mom who fell on hard times, but that scenario is generally far from reality. The real picture is often ugly. The homeowner either abandoned the home or voluntarily deeded the home to the bank. You will hear the term the bank taking the property back, but the bank never owned the property in the first place, so the bank can’t take back something the bank did not own. The bank foreclosed on the mortgage or trust deed and seized the home. There is a difference. A foreclosure is a home that belongs to the bank, which once belonged to a homeowner. During the market crash from 2005 through 2011, many homeowners simply walked away from their homes because the values had fallen and they owed more than their homes were worth. This was not the best solution, in most cases, but it was immediate relief for homeowners. Foreclosure proceedings vary from state to state. In states where mortgages are used, homeowners can end up staying in the property for almost a year; whereas, in states where trust deeds are used, a seller has less than four months before the trustee’s sale. Almost every state provides for some period of redemption. This means the seller has an irrevocable right during a certain length of time to cure the default, including paying all foreclosure costs, back interest and missed principal payments, to regain control of the property. For more information, consult a real estate lawyer. Many states also require that buyers give to sellers certain disclosures regarding equity purchases. Failure to provide those notices and to prepare offers on the required paperwork can result in fines, lawsuits or even revocation of sale. Determine whether you’re the type of person who can easily take advantage of a seller’s misfortune under these circumstances and/or put a family out on the street. Oh, critics will argue it’s just business and sellers deserve what they get, even if it’s five cents on the dollar. Others will feign compassion and trick themselves into believing they are “helping” the homeowners avoid further embarrassment, but deep inside yourself, you know that’s not true. Sometimes buyers are not allowed to inspect the house before making an offer. WARNING: The problem with buying a house sight unseen is you can’t calculate how much it will cost to improve the structure or bring it up to habitable standards. Nor do you know if the occupant will retaliate and destroy the interior. On top of that, you may need to evict the tenant or owner from the premises after you receive the title, and eviction processes can be costly. Another drawback could be liens recorded against the property that will become your problem after title transfer. 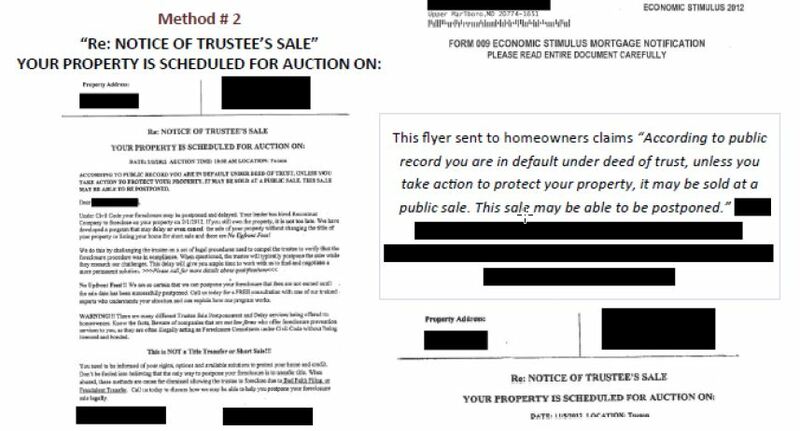 Some investors who buy at trustee sales pay for a title search in advance to avoid this problem. These guys who show up to bid on the courthouse steps are professionals, and they buy foreclosures at auction as a business. They hope to buy the foreclosure at a low price to make a nice profit when they later flip the home. You do not need to hire a real estate agent to buy a foreclosure at the auction, but you do need to know what you are doing to compete with the pros. Many banks do not sell homes directly to investors or home buyers. If a bank is willing to sell homes individually and not in bulk sales, the bank will generally list the home through a real estate agent. There are REO agents who specialize in foreclosure listings. It is more common to buy a foreclosure directly from the bank in a bulk sale purchase. In bulk sales, the banks will package a bunch of properties into one transaction and sell them all at once to one entity. That is the best way to buy a foreclosure if you can afford it because the discounts are typically the steepest. You’ll find the lowest prices for foreclosed homes by buying them at auction. But the auction process is also the riskiest way to buy foreclosures. That’s because you won’t have the chance to inspect a foreclosed home beforehand. Once you get your “bargain” home, you might find that it needs costly repairs that can quickly eat up the savings you thought you’d enjoy. A foreclosed home purchased through auction might also have liens filed against it, such as liens for outstanding tax payments. You might be on the hook for those unpaid taxes, and need to reach a settlement with the IRS. The best news for buyers is that banks are required to pay off any liens filed against these properties. Buyers can also hire home inspectors to tour the homes before they buy them. These inspectors can help buyers determine how much they’ll need to spend in repairs. Buyers can then calculate whether a particular foreclosure is a bargain or a potential money pit. A foreclosed home can present a savvy investment opportunity under the right circumstances. Do your homework, and you might just come away with a diamond in the rough. On average, complaints that allege some type of attorney involvement have produced greater losses per homeowner than all other complaints. While attorneys can be involved in any type of foreclosure rescue fraud, they are uniquely capable of tricking homeowners into believing they can get involved in fake mass joinder or other lawsuit against a lender. The lawsuit schemes can prove to be even more painful for homeowners because they often involve two parts: first a fee for a “forensic audit” to see if the homeowner is eligible to join the suit, then another fee to join the suit. Most promise very impressive results, like the homeowner who was told she could “join a class action lawsuit against her lender. Once this was settled she was guaranteed $75,000.” The final selling point for many of these lawsuits is the assurances made to homeowners that nothing can happen to their homes as long as they are part of the suit. Some attorneys advise homeowners to stop paying their mortgage and instead pay monthly retainer fees to them. Month after month, homeowners pay the fee, believing the attorney is fighting for them. In the worst cases, the homeowner doesn’t realize the attorney is actually providing no service at all until a foreclosure notice arrives. One senior citizen from Williamstown, New Jersey, was contacted by a group of attorneys who guaranteed him a loan modification for just over four thousand dollars. After they allegedly reviewed his documents and made “headway” with the bank regarding a loan modification, they informed him that he was eligible to join a lawsuit against his lender. The suit included over twenty thousand homeowners and they assured him that the lender would settle. At that point the homeowner began making monthly retainer payments of just over a thousand dollars, for eleven months, for a suit that never happened. On top of all of that, the attorneys advised him to stop making his mortgage payments. The most devastating foreclosure rescue fraud scams are those that not only promise a modification, but also trick homeowners into believing the lender has agreed to the terms. The party then instructs the homeowner to pay the “new” modified mortgage payments to them, and they will forward the payment to the lender. In reality, the third party takes the payments and the money never reaches the lender. Homeowners are often blindsided by foreclosure notices after many months of believing they are paying the “new” payments to the lender. The scammers often use copies of government logos and have names that are similar to real government programs. 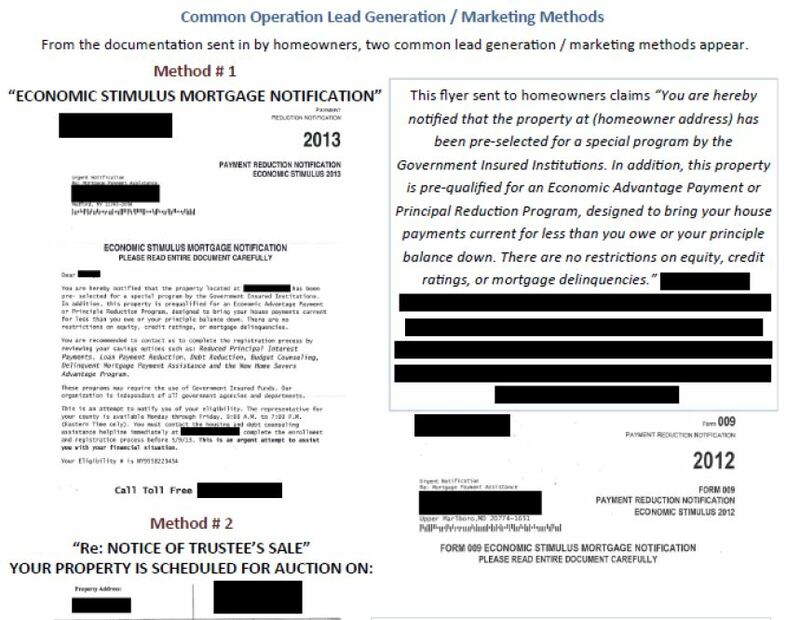 Operation asserts the homeowner has been approved for a modification then steals the homeowner’s “new” mortgage payments. 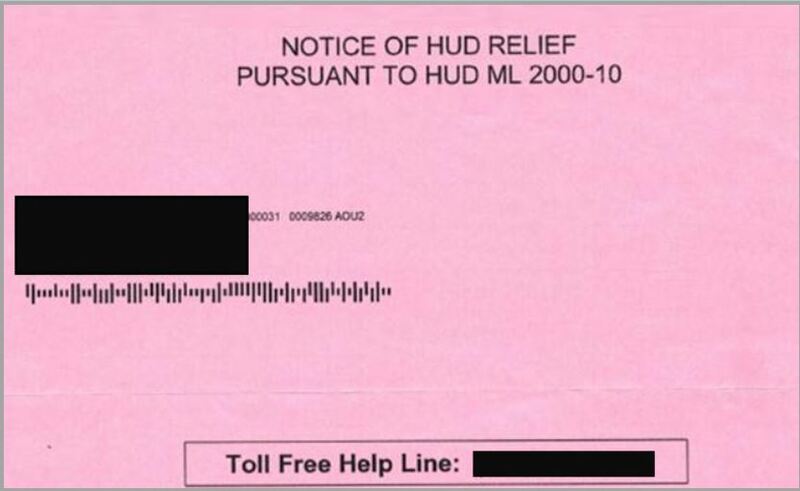 In one heartbreaking example, a woman from Lindenhurst, New York, received a flyer in the mail in early 2013 with the header “NOTICE OF HUD RELIEF.” Believing the flyer came from the government, she called the number on the flyer, and explained that she had tried working with her lender, but had no success. The third party told her that the lender was not being cooperative because they really just wanted to foreclose on her. 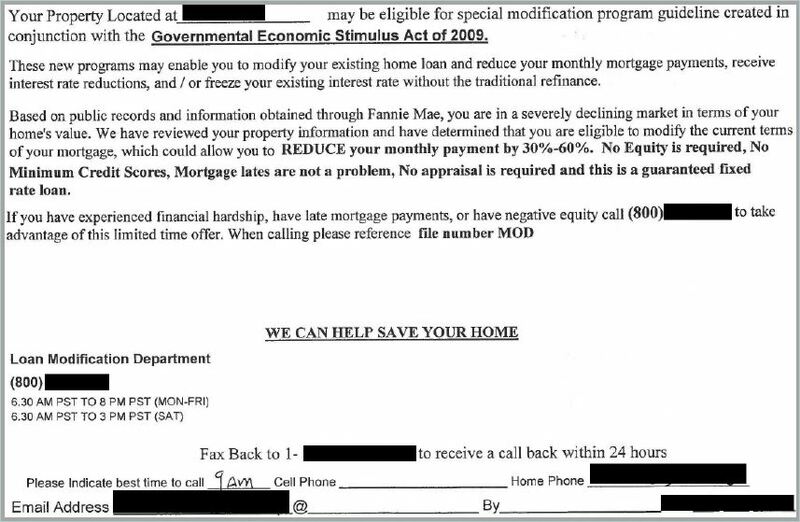 After sending the third party personal financial information, the homeowner quickly received a call back with some good news: they told her she was qualified for “HAMP through Making Home Affordable.” The homeowner was told she now had a mortgage that was a thousand dollars less than her current one, but this was a lie. Then the party told her there was one other thing she had to do before paying the new mortgage payment – pay a “reinstatement fee” of $6,000 that her lender required. Believing it was the final hurdle to reach relief, she sent in the $6,000. Then in March, April and May 2013, she made her new “trial payments” to the third party. They encouraged the homeowner to let them know when she sent the check so they could contact her lender with a tracking number. 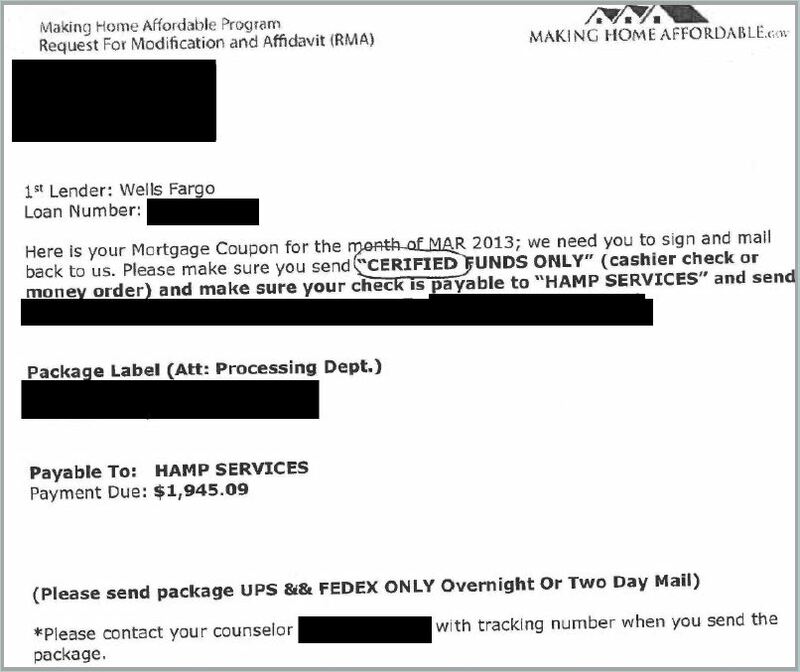 Each month the homeowner received a “Mortgage Coupon” with what appeared to be various government logos on it, including the Making Home Affordable and Treasury logos. The homeowner stayed in close contact with the third party, diligently sending the checks. In May 2013, the homeowner received a call from her lender, telling her she owed almost $30,000. She explained that she had received a loan modification and had already paid the reinstatement fee along with three mortgage payments. The lender representative told the homeowner that she may have gotten caught in a scam. Frantically, the homeowner called her main contact at the operation to which she had been sending her checks. The phone number was disconnected. After losing almost $12,000, the homeowner is now facing foreclosure. Ensure that Homeowners Are Covered Under State Laws Targeting Foreclosure Rescue Fraud: Many states have passed new laws to address foreclosure rescue scamming. However, some of these laws defined “homeowners” that the law was designed to protect too narrowly. For example, some state laws limit coverage to homeowners who are in default or foreclosure, and fail to reach many homeowners who are defrauded seeking to refinance their mortgage or are seeking mortgage relief because loss of job or unexpected medical costs. It is therefore important that state laws targeting foreclosure rescue fraud define homeowners broadly to cover fraud at any stage of the process. As the foreclosure crisis grew, foreclosure rescue fraud – scams designed to capitalize on homeowners facing foreclosure by extracting thousands of dollars in exchange for empty promises of assistance – exploded and increased the pain of these homeowners. The proliferation of this type of fraud is not surprising. Homeowners with financial difficulties desperately need to find help to keep their homes and are vulnerable to scam artists posing as loan modification specialists, for example. Scam operators blanket television, radio, newspapers, and the internet with advertisements in English and Spanish, and also rely on street flyers, signs, billboards, and direct mail solicitation. This saturation marketing, often filled with lies and exaggerations, plays on the trust of distressed homeowners. Scammers use high-pressure sales tactics and false guarantees of success to attract homeowners and to extract large upfront cash payments from homeowners, and then typically do little or no work to obtain the relief promised, essentially abandoning these homeowners. The homeowners not only lose the money they paid to the scam operation, but fall deeper into default and lose valuable time that could have been spent negotiating directly with their mortgage servicer or by going to free a HUD-approved housing counseling agency with true expertise in assisting homeowners in trying to save their homes. As the foreclosure crisis was peaking, these scams replaced predatory lending as a major problem in the housing finance industry and scams resulted in what was known as the “second wave” of the foreclosure crisis. Indeed, many predatory lending operations morphed into foreclosure rescue scam entities. Attorney involvement in scams is growing and appears to be an effective means of ensnaring victims, but some homeowners still approach attorneys with skepticism. Attorneys, or someone pretending to be affiliated with an attorney, attempt to ease this skepticism by involving a “non-profit.” Anyone involved in preventing foreclosure or foreclosure rescue fraud knows the best resource for homeowners is a FREE, HUD – approved housing counseling agency. The problem is that not every organization who claims to fit that description actually does. Some “non-profits” operate as lead generation agencies, gaining the trust of vulnerable homeowners. A search for “.org” in the Database produces over 1400 complaint hits. Homeowners meet with these “non-profits” and things appear to be in order. They aren’t asking for any money, the people seem very nice, and they begin to look over various mortgage documents, free of charge. Providing what appears to be a free service, the “non-profit” can make the homeowner feel at ease and also invested in the process. Once the homeowner is invested, the next level of the scam begins. To keep skeptical homeowners on the hook, the “non-profit” will stay involved throughout the process, assuring the vulnerable homeowner everything is fine. The “Law Group” extracts numerous fees from the homeowner, often saying, “the bank can’t do anything as long as we represent you.” Often in the end, the “non-profit” was started by the same attorney (or non-attorney) who started the “Law Group.” The homeowner loses thousands of dollars and is left wondering, if a “non-profit” will scam them, is there anyone they can trust? The final selling point for many of these lawsuits is the assurances made to homeowners that nothing can happen to their homes as long as they are part of the suit. Some attorneys advise homeowners to stop paying their mortgage and instead pay monthly retainer fees to them. Month after month, homeowners pay the fee, believing the attorney is fighting for them. In the worst cases, the homeowner doesn’t realize the attorney is actually providing no service at all until a foreclosure notice arrives. These “Law Groups” or “Law Networks” claim to include hundreds of lawyers from around the country and claim that they will connect homeowners to lawyers in their home state. The average dollar figure a homeowner loses in Attorney involved Scam is around $3600, and $2850 on non-Attorney Scams. This dollar figure does not take into account the potential domino effect of foreclosure and homelessness these foreclosure rescue scams can have. Homeowners may lose over $3,200 in cash payments to a scammer, but then can end up losing hundreds of thousands of dollars more because their homes fall into foreclosure as a direct result of the scam. At Reno Nevada Foreclosure Prevention Event: One story was particularly memorable. Bill described his experience as follows: Towards the end of 2009, he received a flyer in the mail with the subject line, “RE: Obama Administration’s Homeowner Affordability and Stability Plan.” This “Modification PROGRAM” said he may be eligible for the “Governmental Economic Stimulus Act of 2009.” The flyer contained Bill’s name, address, and exact loan amount. There was a place for him provide his email address and phone number so the group responsible for the flyer could contact him. After receiving the flyer, Bill began talking to the “Name Withheld Law Center” associated with it. He pulled out the contract that was sent to him, which contained a recognized attorney’s name because several state Attorneys General had obtained cease and desist orders against that attorney. The attorney doesn’t appear to have ever been licensed in Nevada, and while he had been licensed in California, his license was suspended in early 2013 for misconduct in three loan modification cases. Bill paid just under two thousand dollars for a loan modification that he never received. Bill’s Dad sat behind him and watched closely as Bill spoke about his experience with the “Name Withheld Law Group,” and about his life in general. Bill’s Dad’s eyes would well up from time to time. This story is so moving because it accurately describes the effects of the foreclosure crisis and foreclosure rescue frauds on struggling homeowners. The vast majority of people looking for help to modify their mortgages don’t have an exploding rate mortgage. They, like Bill, have a normal 30 year fixed mortgage that they could afford pre-recession. Bill bought his home for around $280,000 in 2005, putting down a full 20%, which now is worth somewhere between $130,000 and $160,000. When he bought the home, like many Americans, he couldn’t foresee the worst recession since the Great Depression and the simultaneous housing collapse. These homeowners became prime targets for foreclosure rescue scammers, having been blindsided by the recession and believing the guarantees of success by those who promised to save their homes. With more than three years of data in the Database – including over thirty-eight thousand complaints and over eighty-four million dollars in total reported losses – sadly there is no shortage of disturbing stories. From the dying cancer patient who was scammed out of thousands of dollars while he was trying to make sure his widow could afford the mortgage when he was gone, to the single woman who took in her sister’s four children after she passed away who was scammed into believing she was part of a fake lawsuit, then threatened by the same attorneys who scammed her after she complained. One type of troubling scam appearing over the past few years is the “Military Discount” targeted to active military service members and their families. One man, a senior citizen from Fort Worth, Texas, had hit a rough patch when he was solicited by a third party. At that point, he was one month behind on his mortgage payments and was working hard to keep up. The company guaranteed him a loan modification for $1,600. He was hesitant to pay so much money when he was already struggling to stay current on his mortgage. Sensing his hesitation with the original price, the third party asked if he, or anyone in his family, was currently serving the country. After he explained that his daughter was currently serving the country in Iraq, the third party thanked him for his daughter’s service and told him that he was eligible for a military discount of $300. Lowering the price just enough to make it bearable for him, he paid the fee. Months went by with no results and no refund. The damage was not done there. The company advised him that he needed to stop making his mortgage payments in order to get the loan modification, so he did. He went from being just one month behind on his mortgage when he started working with this operation, to his home being sold in foreclosure. State laws targeting foreclosure rescue fraud should define covered homeowners broadly, as those who seek foreclosure relief services can easily be defrauded before an actual foreclosure or mortgage payment default, thereby excluding them from the coverage of otherwise applicable consumer protection laws. Homeowners who are not yet in foreclosure and who have not fallen behind on mortgage payments should be encompassed in laws regulating third-party services in this area. Some state and federal laws prohibiting foreclosure rescue fraud directly or indirectly (including through prohibitions on deceptive business practices) are only enforceable by government entities.